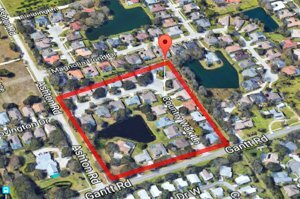 Country Walk is a small neighborhood in the Bee Ridge census designated place (CDP) of Sarasota. Quiet and unpretentious, this community is composed of just 26 homes built sometime in the mid-1990s. Residents of Country Walk enjoy the quintessential features of “bedroom communities,” suburban properties which are often overlooked by searchers of Sarasota homes for sale. This community nestles on the northwestern junction of Ashton Road and Gantt Road which is arterial to Bee Ridge’s major roadways: Proctor Road towards north and Clark Road towards south of Country Walk. Another small neighborhood, Covington Place sits south across on Ashton Road, while directly west of Country Walk are the equally charming homes of Magnolia Pond. All these Bee Ridge communities share a quaint history that traces back to the early 1900s when Chicago socialite Bertha Palmer bought close to 90,000 acres along the coast of Southwest Florida. To develop the acreage, Mrs. Palmer’s family set up the Sarasota-Venice Company which platted the Bee Ridge area and promoted it to settlers eager to cash in on the area’s potential for agriculture. Commercialization soon caught up in this locality with the establishment of a local post office, train station and a canning company in the 1910s. The Bee Ridge residential communities, which started out as small, open neighborhoods, now likewise features gated communities which have been an increasing sight in this area since the 1980s. The sprawling master development of Palmer Ranch eventually rose south of Bee Ridge too, thus now providing an added market boost to homes for sale in Country Walk and in its neighboring communities. Country Walk homes for sale pretty much retains the Old Florida feel trademark of the Bee Ridge communities. The residences in this neighborhood each flaunt an attractive curb appeal with their lush and mature tropical landscaping. The prime home choice in Country Walk are those that back up to the serene lake on the southern part of the property. Prices for market-listed Country Walk homes are typically quoted in the $200s and the $300s. These sales listings offer floor plans measuring between 1,800 and 2,350 square feet designed with three to four bedrooms and mostly featuring private pools. As in its neighboring Bee Ridge homes for sale, the residences in Country Walk are well-suited for families, employees, professionals and retirees. The community’s households with schooling kids benefit from their proximity to Ashton Elementary, Sarasota Middle and Riverview High. 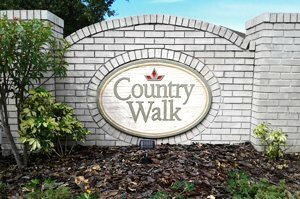 Country Walk’s location, moreover, provides convenient access to a wide array of area amenities, particularly along the Clark Road corridor just a few blocks south of the community. This stretch is host to several retail shops and restaurants as well a healthcare center of Sarasota Memorial. The residents of this community can likewise easily access other commercial hubs and employment centers via Interstate 75 which is less than a mile east of Country Walk. Driving a few minutes westward via Clark Road opens possibilities for more life and leisure activities in Siesta Key and its white-sand beaches. Below are the current real estate listings available at Country Walk.